I came across this recipe here. It calls for Yukon Gold potatoes over the standard Idaho Russets, no eggs, just some olive oil, and it uses “00” and cake flours. These gnocchi are light, fluffy, and crisp, encased in a very potato-ey crunch when fried. Line a large rimmed baking sheet with paper towels. As soon as the potatoes are cool enough to handle, scoop their flesh into a ricer or tamis and rice the potatoes onto the paper towels in a shallow layer. Let cool completely. Working over a medium bowl, sift the all-purpose and cake flours with a large pinch of salt. Measure out 4 lightly packed cups of the riced potatoes (1 pound), and transfer the potatoes to a work surface. Sprinkle the sifted flour mixture and grated horseradish over the potatoes and drizzle with the olive oil. Gently form the dough into a firm ball. Test the gnocchi dough: Bring a small saucepan of salted water to a boil. Using your hands, form one 3/4-inch round (a single gnocco). Boil the gnoccountil it floats to the surface, about 1 minute. Using a slotted spoon, transfer the gnocco to a plate and let cool. It should be light and tender but still hold together. If the gnocco breaks apart in the boiling water, the dough has too little flour; add more. If the gnocco is tough and chewy, the dough has too much flour; cut in a little more of the reserved riced potatoes. Line a baking sheet with paper towels. Divide the dough into quarters. Working with one piece at a time, gently roll the dough into a long rope about 1/2 inch wide. Using a sharp knife, cut the rope into 1/2-inch pieces. Roll each piece against the tines of a fork to make light ridges. Transfer the gnocchi to the baking sheet. Repeat with the remaining dough. Let the gnocchi stand at room temperature for 1 hour to dry. Bring a large pot of salted water to a boil. Fill a large bowl with ice water. Add half of the gnocchi at a time and boil over high heat until they rise to the surface, then cook for 15 seconds longer. Using a wire skimmer, transfer the gnocchi to the bowl of ice water. Drain on paper towels and pat dry. Toss with oil and refrigerate for up to 3 hours or freeze the gnocchi on baking sheets in a single layer. Transfer them to an airtight container or resealable plastic bags and freeze for up to six weeks. Heat 2 1/2 cups of canola oil over medium heat in a 2 quart saucepot. Temperature of oil should be about 375°. Carefully drop the pre-boiled gnocchi in batches into the oil for about 4 minutes until each piece is evenly golden and crispy on the exterior. With a wire skimmer or slotted spoon, transfer the crisp gnocchi to a paper towel-lined plate and sprinkle with kosher salt immediately. Repeat steps in batches with the remaining. In a small saucepot, add the seedless black grapes, water, and agave until the skins of the grapes release their pigment, and the agave or sugar boils down into a syrup coating the deflated grapes, about 5 minutes. Remove from heat, let cool, and reserve. Serve 7-9 gnocchi pieces per portion, plate with olive oil and lemon juice dressed greens, turnip shavings, and stewed grapes. Garnish with grated horseradish and goat cheese. Season with kosher salt and cracked black pepper and serve. Your recipes always fill my heart with joy…they are so beautiful and life affirming. 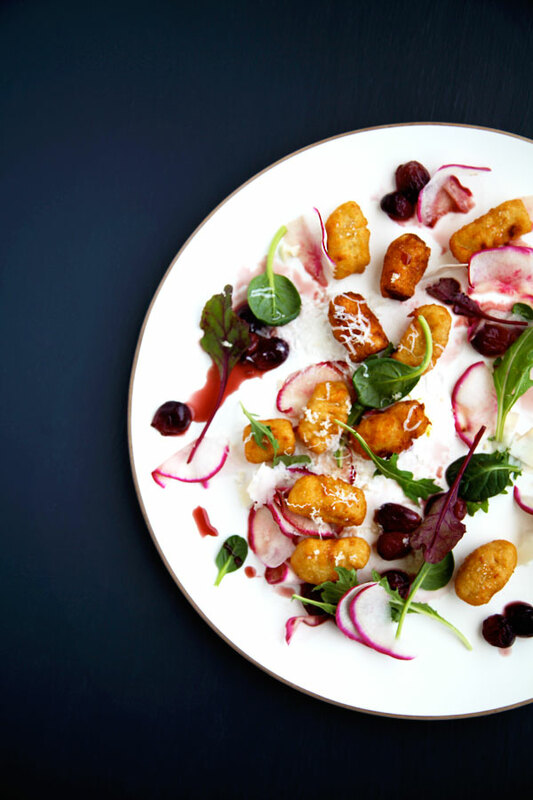 This dish sounds absolutely divine, from the horseradish kick to the crisp gnocci, sweet grapes and scarlet turnips. Love love love! This talks to me. Love all variations of gnocchi and they all have their high points. Plus I’m a sucker for all the ingredients used on this plate. Straight up delicious. I agree with the little loaf! Your cooking is vibrant and “life affirming.” Love the idea of horseradish gnocchi- FRIED- yes! I sincerely hope things get better for you. I’ll be keeping you in my thoughts and prayers! Jess, you’re always so kind, thank you for your continued support and time here. Hope you had a lovely springy weekend. xo. Oh boy that is one spicy flavorful gnocchi! I never had success making gnocchi at home but the recipe is so tempting to let go. Once again, you’ve created a dish that’s new, beautiful, and daring. Lots of love. Yes, cheers to spring! You are so talented, Sarah B. That dish looks like fine art! Your compliments light my days Kate, seriously. The feeling is so, so mutual. thank you. Lovely post, Sarah B. I appreciate your thoughtfulness. I’ve only attempt gnocci once, and it was not a success. So I might have to give this a go! I’m with you. Change and transition has made it hard to write-atleast the happy-go-lucky way I used to. Thinking about you. Spring brings new birth. Right? If that doesn’t maybe that gnocchi will. Oh, do I empathize with the “accumulation of nameless energies.” That theme resonates strong right now amidst these changing times. Yes to spring :) – it has special healing powers, don’t you think? That’s one gorgeous plate of food. And I love all gnocchi. Lovely, as usual.